Ruth is the first artist this year to have completed the form for North Devon Art Trek. The webmaster was able to process her information for the website quickly because all stages of her application were completed. She sent her three images immediately and she paid by BACS which is super-efficient for all concerned. The benefits of getting your applications in early are many. They include maximum exposure for your web pages and supplying the publicity committee members with material to give the press. Time will be needed to add the web pages and images and the production of the brochure is also a long job so it is helpful for the organisers to have all information as early as possible. Artists wishing to apply can follow Ruth’s lead and join up as soon as possible. Go to the application pages by clicking here. Did you know you can comment on one anothers web pages? You will find a comment area at the bottom of each page where you can comment and respond to comments. By commenting on the web pages you will help each other and the whole community and help the NDArtTrek site to be found by interested visitors. Comments are moderated and may be edited. They will appear when they have been approved. Application for Artists and makers is closed for Art Trek 2016, but you are welcome to join us next year! Details for joining are usually added in Spring each year, but you can contact us and ask to be added to the artist list for applications. Ruth not only paints large and expressive landscapes and florals, but is widely known for her unique and beautifully crafted wire sculptures and her statement piece jewellery. 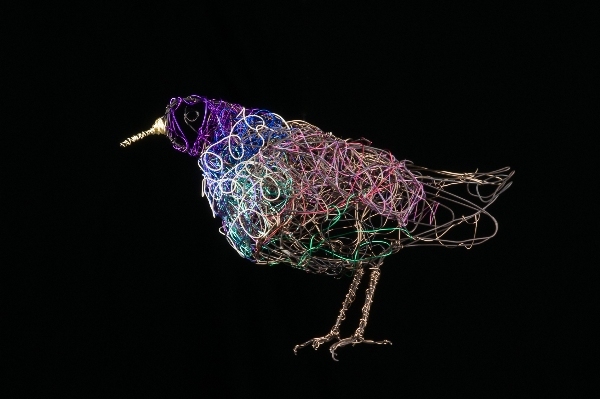 Ruth is also offering workshops throughout art trek where you can have a go making a simple wire/mixed media creation. For more information about booking and cost see website/brochure. Thank for adding additional information. Good to see you have plenty for your visitors to see and enjoy – I have made minor edits here to avoid repetion, without losing any essential information. Do you know any of the other artists in Art Trek, and will you have a chance to visit them.? Perhaps you might comment on their pages and say why you enjoy their work..
There’s a link to Ruth’s page in the main text.